Who Or What Caused The Giant Deficit? The last year of the Bush administration, the deficit as a percentage of gross domestic product was 3.2 percent, well within the range of what most economists think is manageable. A year and a half later, it’s almost 10 percent. First, they’re hoping that you won’t know that standard budget data is presented for fiscal years, which start on October 1 of the previous calendar year. So this isn’t the “last year of the Bush administration” — they’ve conveniently lopped off everything that happened post-Lehman — TARP and all. Can we agree that the deficit in the first quarter of 2009 — Obama didn’t even take office until Jan. 20, the ARRA wasn’t even passed until Feb. 17, and essentially no stimulus funds had been spent — had nothing to do with Obama’s polices, and was entirely a Bush legacy? Yet the deficit had already surged to almost 9 percent of GDP. 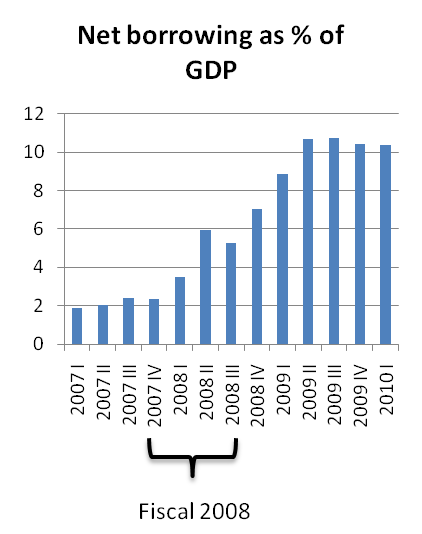 Even in 2009 II, Obama’s policies had barely begun to take effect, and the deficit was already over 10 percent of GDP. I made a similar argument a week ago. It really does seem to be an extremely common belief that Obama's policies created the massive deficits we're seeing now. I think most Republicans and even many non-Republicans think that if we hadn't passed a stimulus, or maybe health care reform also, we'd be having Bush-sized deficits. It's totally false. CBO's budget update from January 2009 -- before Obama took office -- forecast a deficit of 8.3% of GDP. This was without a single one of Obama's policies in effect. And that was before the economic crisis turned out to be deeper than forecast -- which also happened before any major Obama policies had taken effect.